Sese Kitsugai (乞骸　セセ, Kitsugai Sese) is a gashadokuro that loves excavating underground, because their goal is to find their corpse when they were alive. 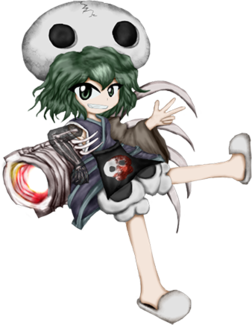 In fact, they are actually a low youkai that wants to gain enough power to become a great youkai. Sese is the stage 1 boss, Extra Stage midboss and Stage Ex+α Boss of Reactivate Majestical Imperial and later re-appears as a possible stage 3 boss on the Neutral route of Brilliant Pagoda or Haze Castle. 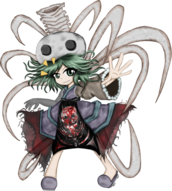 Sese uses their powers as a gashadokuro in order to search for their corpse when they were alive. However, they have no memories of when they were alive and much less where their corpse is located. It's implied they are actually a great youkai who lost their power somehow and wants to find their bones in order to return being a great youkai again. Sese is a cheery happy youkai, but gets easily depressed when things don't go their way (which is very often); typically when they fail to finds their corpse or gets defeated by the heroes. They're very childish and speaks in third-person. Sese believes that the more they fight against people, the stronger they become. However, since they always lose, many people mistake them for a masochist. Their ability is to know what is underground and control it. In combat, they can throw bones at their enemy. While absorbing spirits, they become so powerful that their ability gets upgraded to that of conquering the above-ground. Each form has a different appearance. Sese is based on the legend of Takiyasha-hime. Following the death of Taira no Masakado, Tarou Mitsukuni confronted Masakado's daughter Takiyasha-hime in the ruins of the old Sōma palace, where she summoned a gashadokuro to attack him. This explains why Sese claims that they belong to royalty and has the same green hair as Fumikado. On 17 August 2015, JynX stated that Sese is actually undeveloped. Their full name is Sese Kitsugai (乞骸　セセ, Kitsugai Sese). In their surname Kitsugai (乞骸), the first kanji means "beggar", whilst the second kanji means "bone", "body" or "corpse". "Sese" (セセ) isn't their real name; it was a nickname that they thought sounded pleasant. JynX was asked if there are any special meanings in their name, but they responded with "you can theorize away!". As "Sese" is written in katakana, it might be from Latin, a word that could mean "self". Yabusame Houlen cannot remember Sese's name, so they call them "Boney" (ホネっ子, Honekko-chan). According to JynX, "Sese" is written as "讓讓 (simplified: 让让)" in Chinese, in which an individual character means "to allow", "to yield" or "by", while two put together has no inherent meaning. Sese has green eyes and green, shoulder length hair. They wear a skull on top of their head that's shown to be detachable. They dress in grey clothing and white bloomers, where their hat and gloves contain numerous bone-shaped ornaments. They're fairly short and is around the height of Sukune Katano and Shion. When they absorb all the spirits the heroes had been recollecting during Reactivate Majestical Imperial, Sese wears a gray and red dress with detached sleeves and spider lily motifs. In this form, the skull on their head becomes bigger and resembles more an actual gashadokuro. After the spirits abandon their body, Sese gains a new form, which is a composite of their old form and their empowered form. When JynX was asked why Sese is not at a large size as a gashadokuro would be, they expressed that Sese could be bigger if their "body is perfected", but said having them smaller is cuter. Sese's role is rather limited, and they're not connected to the plot in any way. While looking for their corpse, they caused trouble at the graveyard of the Human Village, so there's a bounty for their head. They aimlessly wander around the Shrine Road, hoping to find their corpse. Instead, they bump into (or rather, annoy) the heroes and ends up being defeated. They return after finding some parts of their skeleton next to the Harujion, the soul-eater flower. When the heroes defeat Tenkai Zuifeng, Sese decides to simply absorb all the spirits the heroes had been recollecting and transform into a more powerful form, claiming that this is their original form. With their new powers, they attack the heroes but is defeated for third time. After their defeat, the spirits Sese absorbed abandon their body because they didn't find all their bones there. Therefore, it is implied that their new form is temporary at most. After the spirits abandon their body in Reactivate Majestical Imperial, Sese gains a new form, which is a composite of their old form and their empowered form. They are still obsessed with finding ways to become stronger in order to become a great youkai. It also seems that they took Yaorochi's words to heart and is training to become stronger. In all routes, it's revealed that Tsurubami and Tenkai were either feared, hated or respected due to being the dictators of Mugenri and their immense power. Sese doesn't understand much about what's going on and just attacks anyone in order to become stronger. At the end of the Brilliant Pagoda or Haze Castle routes, Sukune and Sese don't care much about the war between the Dragonfly Army and the Imperials. In the end, they meet Suzumi Kuzu, the one responsible for the words about the "The mirror of Heaven shall split" in order to lure Tsubakura. Suzumi reveals their intention to make Tsubakura's life a living hell and after a hard fight, Suzumi erases their memories again (with Tenkai being the only one who vaguely remembers). ↑ Reference to Braver (sometimes Brave Slash), Cloud's Limit Break from Final Fantasy VII. ↑ Possibly a reference to a Magic: The Gathering card of the same name. ↑ Possibly a reference to a Magic: The Gathering deck, used in Japan, of the same name, containing the card "Necropotence". They may be the most persistent Len'en Project bosses, appearing as a midboss in two stages, and as a stage boss twice in one game. They're the second character that has a more powerful form for the Extra Stage, besides Lumen Celeritas. Sese has the lowest number of spell cards as an extra stage boss, having only 5 spell cards. This page was last edited on 21 November 2018, at 07:24.